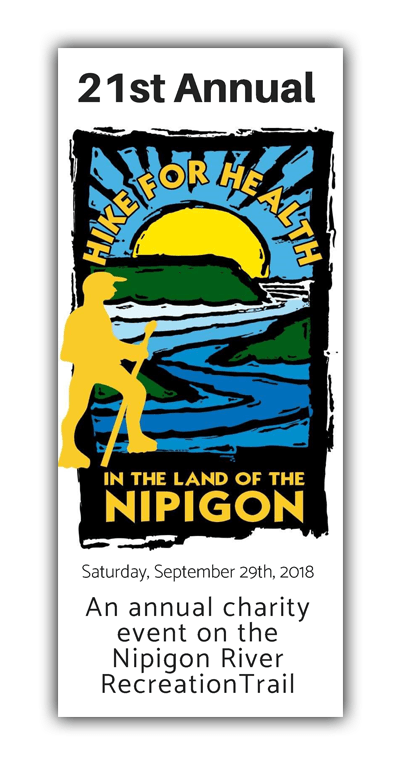 Every year on the last Saturday of September, the Hike for Health is held along the Nipigon River Recreation Trail in order to raise monies for local needs. During the rugged 10 km trek hikers enjoy spectacular views from three lookouts over Nipigon Bay on Lake Superior, and later relax on the leisurely portion of the trail beside the Nipigon River and its wetlands. This year, the hike takes place on Saturday, September 29th. The day will begin at 8:30 am with registration and opening ceremonies at the Nipigon Marina Pavilion. A light breakfast will be served and fundraising/draw prizes awarded. Beginning at 9:30, buses will start shuttling hikers to the Red Rock trailhead where they can begin the hike. **NEW** Due to a shortage of volunteers, there will be NO LUNCH provided. We encourage hikers to visit participating local restaurants to enjoy “Hiker’s Specials” and show their 2018 participation medal to receive 15% off their meal, valid September 29th, 2018 only. **NEW** A family Scavenger Hunt, presented by the Nipigon Family Health Team, will keep your kids moving on the trail as they identify flora and fauna along the way. Show your completed Scavenger Hunt sheet at the end of the hike to win a special prize. This is a challenging wilderness trail, with rugged terrain and long stairs. Appropriate hiking footwear and clothing is strongly recommended. An intermediate fitness level is required to complete this hike. Download the pamphlet on this page and read through it carefully, then click on the Register page to register online, or to download forms to register in person or by mail. TO QUALIFY FOR TOP FUNDRAISING PRIZES, WE MUST RECEIVE YOUR REGISTRATION AND PAYMENT BY SEPTEMBER 21st at 4:00 PM.